1. They don’t want to look bad. 2. They make tons of money off his books. Hence their response. To have Driscoll’s book, A Call to Resurgence, panned so early in the roll-out is a PR disaster. He plagiarized ‘his friend’, and as you know in these circles the ‘friends’ stick together. They worked something out behind the scenes. They aren’t going to tell you that though. Next week, we will see announcement that the charges had no merit…because it won’t go anywhere. They do it the same way with other issues. I think they count on their Koolaid drinkers support, and hope the rest of the people won’t pay attention. Its the group they will lose they need to worry at least ‘a little’ about. It might not be worth it to them though. Money speaks. Someone sent me this link about Hotel California being plagiarized from Jethro Tull’s tune. I suspect this will happen with the Resurgence book, but I’m really curious about the D.A Carson material and what will happen there, especially since D. A. Carson wrote about plagiarism. It seems he would need to respond in a strong manner in light of the strong words he wrote. It seems like only the academic and research communities fully care about plagiarism any more. Sadly, since most of the audience who will read his book do not read scholarly academic materials, they most likely just will not care about this at all. Just like that local law firm who ALL got disbarred for shady business practices a couple years ago. Their defense? I agree with Hannah Thomas and Headless Unicorn Guy. 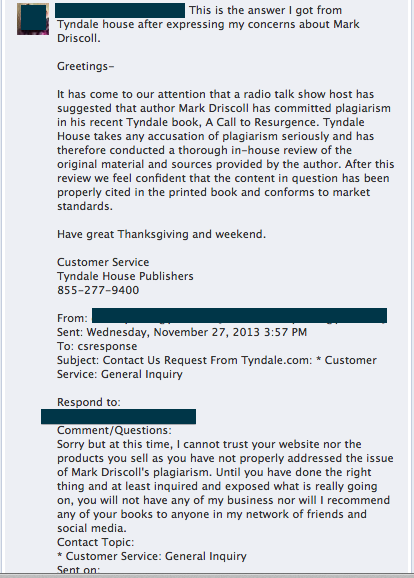 What Tyndale House is saying here is basically, “We won’t get sued for this.” They aren’t saying anything more than that. As if that clears Driscoll of wrongdoing. It does not, not by any stretch of the imagination. I’m sure that they were in touch with Jones about it, and everyone reached an agreement to make it all go away. And no doubt, friendship would help in a case like that. But again, that doesn’t clear Driscoll of plagiarism. That just keeps the Jones problem out of court. But that sure looks like plagiarism to me. And don’t tell me Tyndale wouldn’t do it differently if they had it to edit over again. You can bet the farm that they wouldn’t clear that as “properly cited and conforming to market standards.” No way. And all that doesn’t even begin to address the DA Carson issue. Um, just saying: ALL of the present-day Christian publishers are in the tank for New Calvinism. The guys at Tyndale must be wearing ostrich feathers. How else could they imagine that can just hide their heads in the sand? This issue may fade from the memory of some, but certainly not all. If Tyndale thinks that these accusations against them and Driscoll will simply go away, then they’re living in some fantasy land. AWESOME clip from YouTube! I’ve got to hear more of Tom Lehrer’s stuff. The songs he made for “The Electric Company” are pure gold, and this one made me LOL. I’d have loved to hear the reaction from the audience that first heard it.